Successfully Added JESY J9S Rugged Phone - Android 7.0, Helio P10 Octa-Core CPU, 4GB RAM, 5.5-Inch Display, Wireless Charging, 6150mAh, 16MP Cam to your Shopping Cart. The JESY J9S Rugged Phone is the perfect Android smartphone for outdoor lovers and people who work in a tough environment. 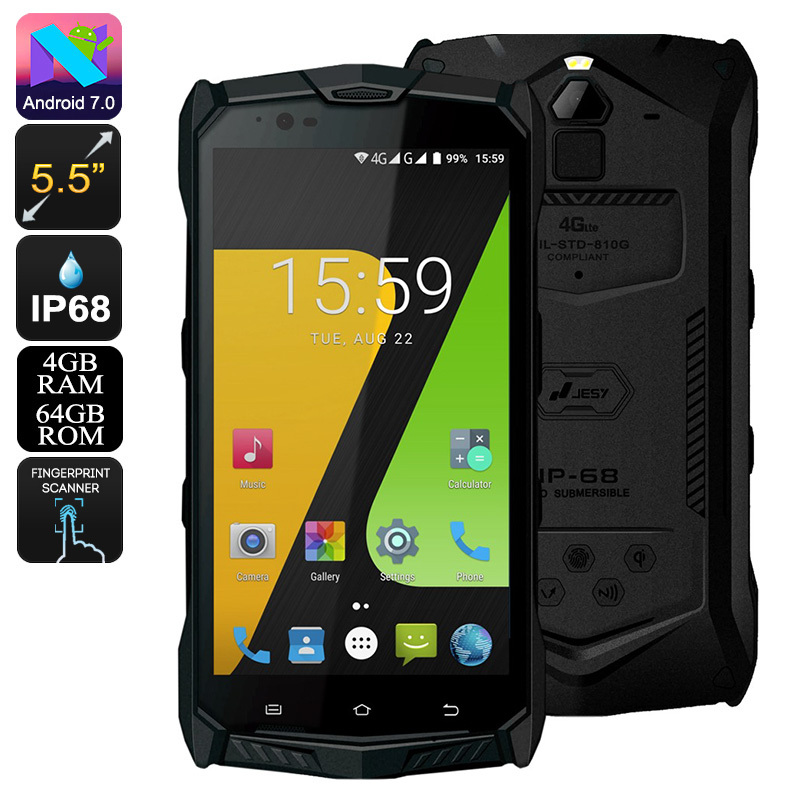 With its fully rugged IP68 body, this Android phone has been designed to take a punch. The cell phone is fully resistant to water, dust, and drops. Therefore, you won’t have to think twice about taking it along on your upcoming outdoor adventures. The phone itself features a number of outdoor features as well as a whopping 6150mAh battery. This cell brings along up to 200 hours of standby time. Whenever it runs low on juice, you’ll be able to charge it wirelessly thanks to the phone’s NFC wireless charging support. This rugged Android phone is not only tough from the outside. Within its rugged body, the JESY J9S smartphone packs the powerful Helio P10 processor. This Octa-Core CPU has been clocked at 2.0GHz. Therefore, you can be guaranteed of an exceptional performance whenever you turn on your Android phone. The smartphone furthermore treats you to 4GB of RAM to meet all your multitasking needs. Along with its Android 7.0 operating system, this rugged smartphone lets you enjoy a smooth user experience without any exceptions. With its Dual-IMEI numbers, this Android rugged phone treats you to great connectivity. It furthermore supports 4G thanks to which you’ll be able to browse the web at any given moment. On its 5.5-Inch Full-HD display, this Android phone lets you enjoy stunning visuals while playing games or watching movies. The phone comes with 64GB ROM to meet all your storage needs. This leaves you with plenty of space to save your favorite media files and the stunning pictures you snapped with the phone’s 16MP rear camera. The JESY J9S Rugged Phone comes with a 12 months warranty, brought to you by the leader in electronic devices as well as wholesale Android phones..